An very good old French pear with crisp juicy sweet flesh. 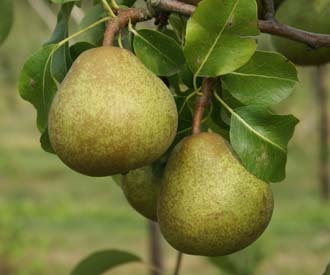 Doyenne Georges Boucher pear was raised in France by M Pinguet-Guindon and named after Georges Boucher, the Parisian horticulturist. It first fruited in 1894. It was highly regarded and received three gold medals in France. The fruit is medium sized, conical in shape and the green skin is largely covered in a golden brown russet. It has white, very juicy flesh, firm flesh with a good sweet flavour.